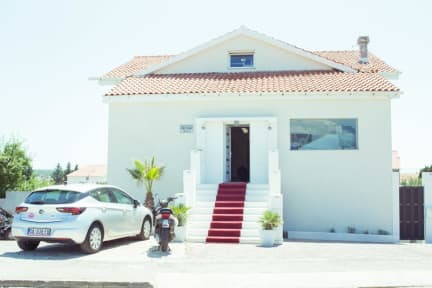 Welcome to the Crazy night new modern guest house offering great value accommodation of the island of Pag in city Novalja. We offer a nice & cosy place to stay in the biggest down town, urban, modern design.! Full service property open 24/7, where you can chill out in SWIMMING POOL, sleep & rest, surf the web, meet new friends from all around the world & at the same time enjoy friendly prices that save money for fun. ideal for individual & group accommodation.Kitchen is shared. Guesthouse is located just 5 minutes walk from the center. We are located from the catamaran lines 500 meters, from the bus station 2 km and from the famous beach Zrce 5 kilometers. Ottimo ostello personale il top!!! La struttura vanta un'ottima posizione, vicino al paese di Novalja; mancano però gli armadi personali, la pulizia dei locali non è buona. La cucina non è pulita e nemmeno spaziosa. La piscina non è clorificata ed è meglio non usarla. Le foto che appaiono sui vari siti, sono una mera illusione.